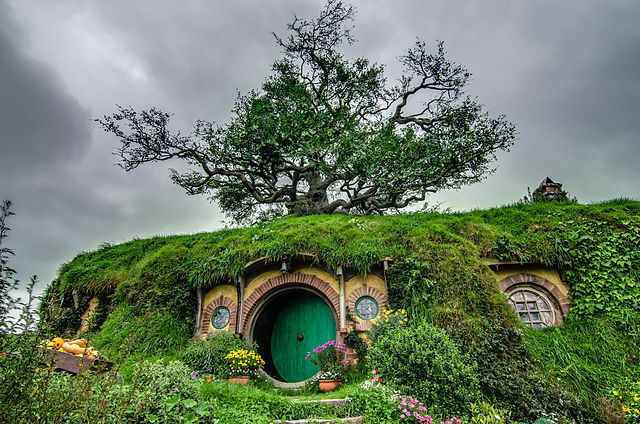 I’ve recently come across the site of a construction company making houses modeled after hobbit holes. I don’t know how this company is going to shape the doorways, but the image below is how they’re described in The Hobbit and The Lord of the Rings. Can a mezuzah be affixed to such a completely round doorway, or does this not have a “side” where a mezuzah belongs? Mor U'Ketziya Orach Chaim 21 - right side - column beginning ואין זו תשובה נצחת says that a door made like a Kippa does not require a Mezuza. Pischei Shearim - page 238 mentions that even if a doorway is rounded from the bottom there are those that say it does not require a Mezuza. Thus there are those who would say a completely round doorway would not require a Mezuza. Not the answer you're looking for? Browse other questions tagged halacha mezuzah architecture-design .